Myopia, or nearsightedness, is a refractive error, which means that the eye does not bend or refract light properly to a single point of focus to create a clear image. Myopia occurs when the eye is longer than normal or has a cornea, or clear front window of the eye, that is too steep. As a result, light rays focus in front of the retina instead of on it. This allows you to see near objects clearly, but distant objects will appear blurred. Myopia is very common and is estimated to affect 25 percent of Americans. It is an eye focusing disorder, not an eye disease. Myopia is inherited and is often discovered in children when they are between 8 and 12 years old. During the teenage years, when the body grows rapidly, myopia may become worse. Between the ages of 20 and 40, there is usually little change. 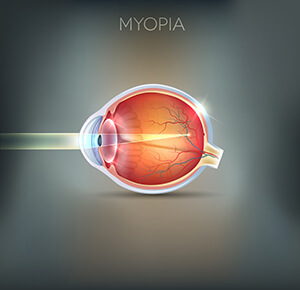 Myopia can also occur in adults and is generally treated with glasses or contact lenses, but myopia may also be treated surgically.